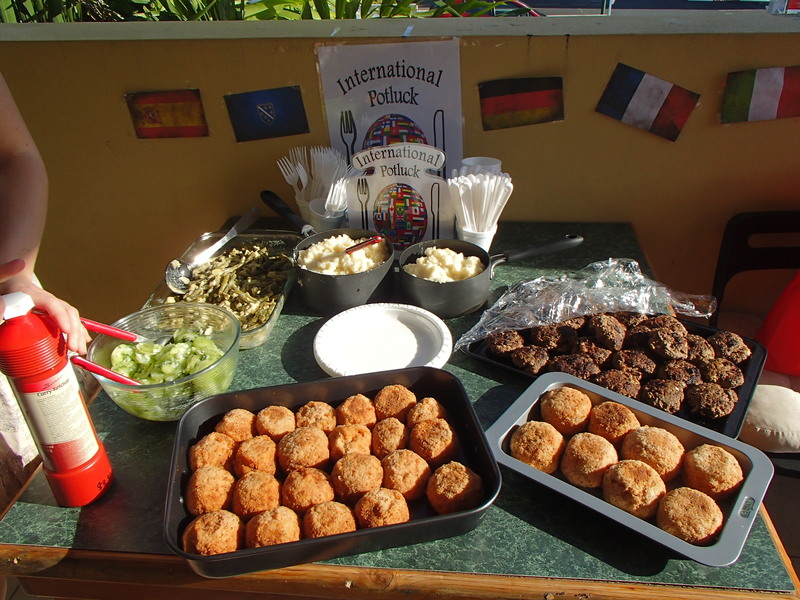 One event I ALWAYS look forward to has been our ambassador potlucks that have taken us on an international culinary tour. Next stop on our food tour… Europe! Our hosts were Corey (Italy), Diego (Spain), Malli (Germany), and Remy (France). We changed it up a little and had an afternoon potluck as we had an evening booking to view the Santos GLNG City of Lights from the Wheel of Brisbane (which I will talk about in my next post). When we arrived, Corey and Diego were cooking up a storm in the kitchen. There offered us Diego’s infamous sangria. It was so tasty and full of bright orange slices! I loved Malli’s German dish. I wish her dish would miraculously appear before me right now. Remy’s aranchini, fried rice balls coasted with breadcrumbs, were filled with meat, tomato sauce, mozzarella, and peas. They were SO scrumptious! I like how the name originated because the round shape and color are similar to that of an orange which in Italian means arancia. I thought it’d be fun to share the rest of the menu below. Then, after we had stuffed ourselves until oblivion, Malli’s roommate, Steven, performed a private little concert for us. He is part of a duo called Strings for Ammo. He sings and plays guitar while his partner plays the violin. He played the song Whiskey on the Rocks, which is now one of my favorite songs! He performed a few more numbers for us and since we have a group of very talented individuals in our group, the concert continued! We sang a mix of 80’s ballad and closed with Diego’s favorite song, La Bamba! This potluck was fantastic and I can’t wait for the next one. Thank you to the chefs who prepared everything. Super fun photos from the potluck can be viewed here!